For the first two and a half quarters of the Knicks' 89-87 Game 4 win over the Heat this afternoon, the Garden crowd only seemed to respond to external stimuli, like when the Beastie Boys were being pumped over the intercom system. It was difficult to blame them. The Knicks were down 3-0, which was bad enough, but even if they'd been up 3-0, it would have been tough to find much to be excited about: Neither team could shoot, the pace of the game was hideous (thanks largely to some ticky-tack, intrusive officiating), and the whole affair had the feel, yet again, of a nasty February Big Ten game. And then, midway through the third quarter, everything changed. Suddenly, you couldn't even hear the Beastie Boys over the crowd anymore. The Garden has been waiting eleven years for a playoff victory. Their collective lungs verified just how much they wanted it. Somehow, they got it. Yes, the eleven-year streak is over, thanks to 41 points from Carmelo Anthony and an impressive, if choppy, 20 points from Amar'e Stoudemire, returning from his supposedly devastating hand injury. (Not to doubt ESPN's Chris Broussard, who had reported that whole "hand was falling off" business, but seeing Amar'e out there today did make us wonder just how gruesome that injury really was.) Both superstars missed crucial free throws late, which the Heat took advantage of, particularly LeBron James, who pulled off one of the most amazing plays we've ever seen him make to foul out Tyson Chandler with twenty seconds left and cut the lead to one. But the Knicks' defense — which was honestly quite terrific all day, even when Chandler was out of the game — held on through the final possession, forcing Dwyane Wade to take a terrible shot as time expired. 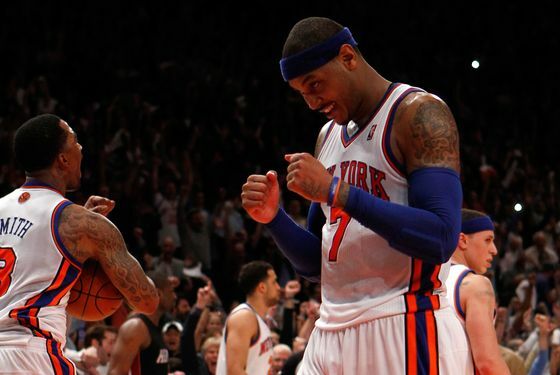 And, amazingly, bewilderingly, the Knicks had their victory. And the series is going back to Miami. How long it will keep going is an open question, particularly because, well, the Knicks don't have many guards left; it's tough to figure out who in the world is going to be in this rotation, thanks to a horrific injury to Baron Davis. With the Knicks down one with five minutes left in the third quarter and running a fast break to try take their first lead since the first quarter, Baron Davis went down, as if shot, just like so many other players have this postseason, from Derrick Rose to Iman Shumpert. It was another cruel Knicks injury, and this one had to be the most painful; his kneecap dislocated when he planted it, and you could see it poking through the skin. It was, to put it mildly, freaking gross. Yet that was when the game really kicked into gear; the Knicks kept coming, kicking off yet another run, their second of the quarter. (The first one was less a "run" than "the Heat going seven minutes without a field goal.") The Knicks even took a six-point lead at one point before, once again, James fought back for the Heat. Today, James was the force at the end of the third quarter and Dwyane Wade was the guy in the fourth; Miami hasn't exactly looked dominant in any game this series but the first one, but they are starting to figure out how their superstars work, if not together, at least in casual separation. Until LeBron James of course hit a 3-pointer to tie it in the fourth. And kept coming. Still, though: The Knicks kept coming, too, and whatever your thoughts about this team, however frustrating this series (and so many parts of this season) has been, as much as you might (justifiably or otherwise) complain about Carmelo's Hero Ball, Amar'e's defense and anger management issues, J.R. Smith's, well, everything ... the Knicks fought their arses off this whole game. This is just one win in a series that requires four, but the Knicks left their souls on the court, particularly Amar'e, who spent most of the afternoon actively auditioning for the fans to love him again. One gets the sense he succeeded. The Knicks are unlikely to make this series go that much farther, but that doesn't make this win any less fun. The Knicks needed a win just to show some progress, just to give their fans something back, fans that have sold out the Garden for eleven years of bad basketball, waiting to be anything other than the laughingstocks of the NBA. One game isn't going to change all that, and it shouldn't. But that's why the Garden went so crazy, and that's why so many Knicks fans have been so celebratory and plainly relieved. They just needed a positive. They, at last, got one. So! Game 5 is Wednesday night, in Miami. The Knicks have one point guard, Mike Bibby (whose huge fourth-quarter 3-pointer is surely how he'll be remembered in New York, and that's not a bad memory at all), and two "shooting" guards, Landry Fields and J.R. Smith, who was 3-for-15 from the field and intensely aggravating ... until he'd pull off an amazing play out of nowhere. The Knicks are way, way short in the backcourt without Davis and Shumpert, and you can be sure the Heat will attempt to capitalize in every way. The Knicks main option may be to give Toney Douglas a ton of minutes, which is certainly the opposite of what Mike Woodson would like to do, considering he's buried him on the bench since he took over from Mike D'Antoni. Or ... or ... Hmm. Maybe that surgically repaired left knee, the one that caused everyone such sadness back in March ... maybe two more days of rest will be enough. Maybe the Knicks' desperate need is enough. Maybe ... maybe ... we'll see Jeremy Lin. (!!!) Forcing a Game Five might not give the Knicks a strong chance at winning this series, but it might give them that. The point is, the Knicks' season is not over. The point is, there is still a little hope. The point is, the streak is over. There's another game on Wednesday. This loopy, nutty season, man. What could possibly be next?